48時間以内に通常我々発送。典型的には、ご注文は、4～8営業日以内に配信されます。 ご注文は、弊社にとって非常に重要です。 Format: Music CD, Decca Records. 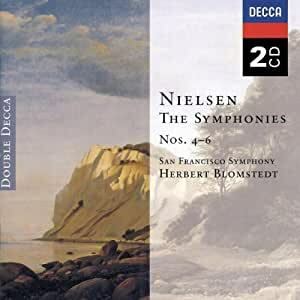 Classical music CD release from San Francisco Symphony Orchestra with the album Nielsen: Symphonies Nos 4 - 6. Released on the label Decca Records. Classical music CD. This hard to find pre-owned music CD is fully guaranteed. This is a two CD set. I had managed to avoid Blomstedt's SFS Nielsen cycle for decades. A knowledgeable friend suggested I acquire them and his advice was good! These are splendid performances. I particularly like the 5th, but the 4th and 6th Symphonies are also well done. Orchestral playing and sonics are outstanding throughout. These recorded performances are a great tribute to the veteran conductor's tenure in San Francisco. While I value the conductor's earlier symphony cycle on EMI, these recordings are more energetic and seem to me to have a greater level of commitment. Sonically, DECCA takes the palm! 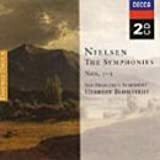 Nielsen's symphonies are yet another Scandinavian delight. They are tightly and powerfully constructed, much in the manner of Schumann's symphonies. Blomstedt does them justice. These are beautiful recordings. The orchestra's sound is rich and full. The faster, louder passages are attacked with precision and dexterity. The lighter, softer pastoral parts are contrasted marvellously well. There is not a single technical aspect of these recordings to diminish what the conductor and orchestra are trying to convey (unlike the LSO/Schmidt set). If you want to hear what Nielsen is all about, this is it. I may never buy another set of Nielsen Symphonies again. After these virtually definitive performances, why spend the money? 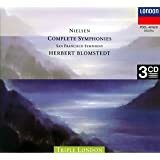 The SFSO gets 5 stars, Blomstedt gets 5 stars, and the recording/engineers get 5 stars. As close as you'll find to perfection as far as I'm concerned. This is a fine collection of symphonies by a composer whose works ought to enjoy greater popularity amongst concertgoers. Solid performances. You cannot go wrong with this purchase.